The smartphone is the device based on Windows Mobile 2003 for Smartphone, and the communicator - on Windows Mobile 2003 for Pocket PC. That's not the full list, but the key approaches. Let's start from the last statement. In a year and a half with the release of WM2005 the distinguishing line between these two operating systems will be erased, WM2005 for Smartphone will support touch screen and a 320x240 resolution. The approaches 4 and 5 sound naive, these are just general words that can be hardly applied in practice or formalized, there are no definite criteria. Nokia devices of the 9000 series and the term "communicator" have been almost synonyms for a long time; that was how the manufacturer called the device. Well, that means, the presence of a touch screen can be a good criterion. It's generally accepted to call the Sierra Vog with a built-in flip QWERTY-keyboard a smartphone, not a communicator. We can provide more such examples. That's why this criterion is no longer relevant. The manufacturer doesn't always call its products smartphones or communicators (very often it makes up new terms, for example Wireless Any Network Digital Assistant). In all, the division of devices into smartphones and communicators is like dividing all TV-sets into "kitchen" and "room", all magazines into "useful" and "entertaining", powerful home PCs into "the dream of a gamer" and "the ideal computer to work with graphics". So, to avoid term confusion we'd use both terms "smartphone" and "communicator" as equals in our review. A smartphone (communicator) is a mobile pocket device powered by a full-fledged operating system and equipped with an integrated communication module. So let's put an end to the story here. The Taiwanese company HTC, the Hardware platform development partner of Microsoft corporation, releases already the third generation of smartphones. By the way, the overwhelming majority of modern Pocket PC handhelds was created by HTC (HP iPaq, Dell Axim, Fujitsu Siemens Pocket LOOX). HTC smartphones have been developing so swiftly, so we can be sure that two key problems will be solved in the near future (battery life, large dimensions). See yourself, taking into account the latest products by the company we can say with no stipulations: HTC Typhoon - the smallest smartphone with the longest battery life, HTC Blue Angel - currently the most functional communicator, HTC Magician - the smallest smartphone based on Pocket PC platform. We hope, the company won't slow down its developments in the near future. Today we review the platform with the code name HTC Magician [I wonder what kind of magician is it, light or dark? Given the coloring - it is light]. Before the release of HTC Magician HTC products had two definite directions. 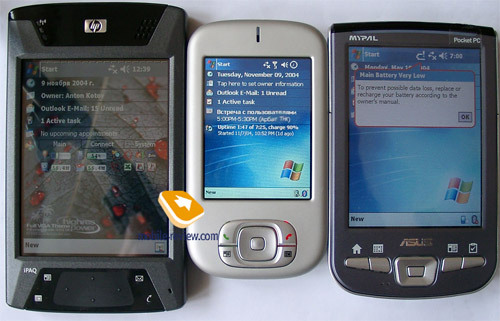 The devices based on MS Smartphone platform that looked like an ordinary phone, with a digital keypad and without a touch screen (HTC Tanager, then HTC Voyager and Typhoon). And the devices based on Pocket PC looked like a PDA with larger dimensions than for Pocket PC and a standard screen (HTC Wallaby, then HTC Himalayas and HTC Blue Angel). The HTC Magician platform is somewhat between, a medium version, new third direction. In essence it represents a decreased copy of Pocket PC smartphone of the second generation (HTC Himalayas), extended with a 1.3-megapixel camera and new version of the operating system Windows Mobile, other changes are not that important. Like other HTC smartphones HTC Magician will appear in the market under various trademarks depending on the local market. The Magician will have the following names: Qtek s100, I-mate JAM, MDA Compact, Dopod 818, mini-XDA and so on. They will differ only in the set of preinstalled applications and inscriptions on the casing, other features will be completely identical. For the test we've got the Qtek s100. 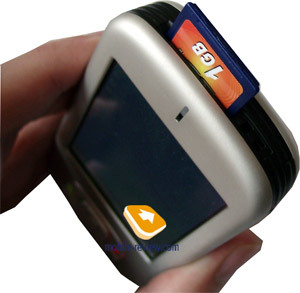 In width and height Qtek s100 is the smallest Pocket PC, smaller than Sony Ericsson P900 and comparable with Nokia 7610. 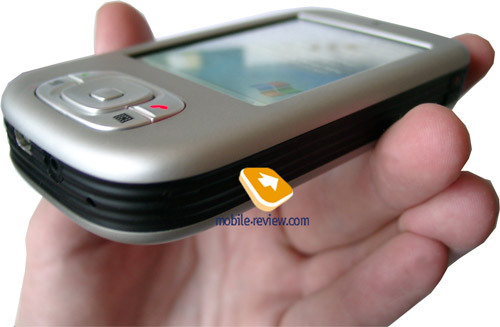 Though the comparison with Nokia 7610 isn't right, the Nokia model has no touch screen. The assembly quality is traditionally high for HTC products, when you squeeze the device, you won't feel a backlash. You feel its 150 g weight in the pocket of your shirt, but when placed in jacket's pocket it's not noticeable. The ribbed surface at sides is somewhat splayed, it is at the angle to the front panel, due to it the casing doesn't slip in hands, and it provides a comfortable work with the smartphone. The design of Qtek s100 is simple, even very simple. It can be called strict or futuristic, it has no peculiarities - it's just "simple". The front panel and the battery's cover are made of metal, which is pleasant to touch. The sides are covered with black ribbed plastic, and the back panel has silver plastic. Below the screen you find a big and comfortable 5D-pad, there are two application buttons (Calendar, Contacts), Send and End buttons around it. You can assign the application buttons to launch applications or actions as you like. I don't understand why it's impossible to assign several functions to one button by standard means (short click, hold), recently the function has become almost standard for Pocket PC. Above the screen there is a LED indicator responsible for GSM-network activity, Bluetooth activity, reminders and charging status. The indicator is combined with the dynamic hole. The sound during talks rouses no reprimands, it's always loud enough. At the left side there is a volume slider, using some exterior programs you can assign it to Up and Down actions, that is very comfortable to read e-books and browse Internet pages. Here are also a voice recorder button and a camera button. At the right side rest Power button and IrDA window camouflaged in the ribbed black surface. On the top you find SD/MMC slot supporting SDIO (in addition to memory cards you can plug different peripherals, such as Wi-Fi or GPS SDIO cards). Pay attention to the fact, a memory card goes tight into the slot; you have to help it with the nail. Then you see a strap hole, so you can wear the smartphone on your neck or wrist, and the silo. The stylus is comfortable to work with, its size and weight are almost optimal, and it safely rests in the silo. The back panel has the camera lens and the battery compartment. At the bottom there are plenty of elements: standard mini-USB port for synchronization (a novel feature for Pocket PC smartphones), soft rest button, microphone and standard 2.5 mm audio jack. Qtek s100 is equipped with a removable Li-Ion battery capacious of 1200 mAh, the same as in Qtek 2020. The situation with the battery life brought no good or bad surprises, it complies with the level for this class devices. Under the most extensive usage (20 minutes of talks, 2 hours of the Internet via GPRS, 3 hours of PDA functions, an average backlight level) the device worked for 24 hours. Using it 2 hours per a day with 20 minutes of talks we enjoyed Qtek s100 for more than 48 hours. 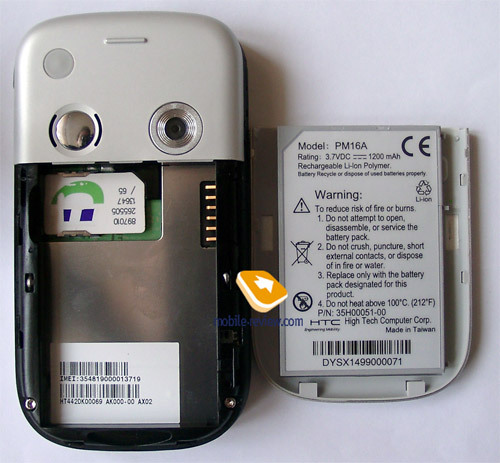 If not use the device; the battery gets drained over 72 hours. In the e-book mode (the lowest backlight level, the phone is on) the smartphone worked for 11 hours. 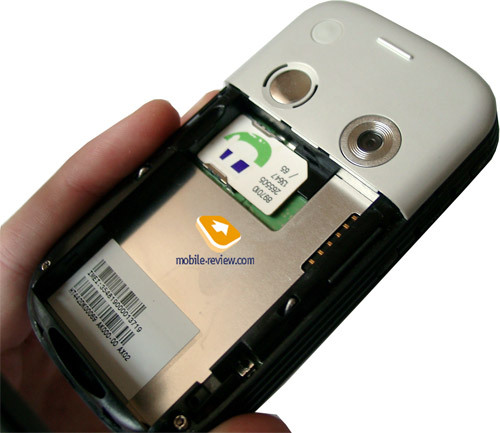 The SIM mount is standard, however you'll face some difficulties ejecting the card. In its features and image quality the screen is typical for Pocket PC of low-end and mid-range classes - it's a transflective TFT matrix with a 320x240 pixel resolution displaying 65K colors. Because of small dimensions of the smartphone the screen diagonal got shorter, from standard 3.5" to 2.79". In general, there is a definite trend for smartphones based on Pocket PC to shorten a screen diagonal from 3.5" to 2.8-3". If we compare the screen of HTC Magician with other Pocket PC devices in quality, we find it far better than in Rover S2 and Eten p300, but on the same level with Asus p505.